Pokemon Silver Version Game Boy Color Cleaned & New Save Battery Nice! Item must remain in original condition. 4.5 out of 5 stars - Pokemon Silver Version Game Boy Color Cleaned & New Save Battery Nice! 263 product ratings263 product ratings - Pokemon Silver Version Game Boy Color Cleaned & New Save Battery Nice! Included the plastic protector cases. Trending at $15.70eBay determines this price through a machine learned model of the product's sale prices within the last 90 days. L3630- Pokemon Silver & Red version NINTENDO Gameboy Video Games NR . Condition is Very Good. Shipped with USPS First Class Package. Used in good working condition. Battery may need to be replaced. Item location: Glassboro New Jersey. Pokemon Crystal. Pokemon Gold. Pokemon Sliver. Pokemon Yellow. Pokemon Red. New ListingPokemon: Silver Version (Nintendo Game Boy Color, 2000) Authentic - New Battery! 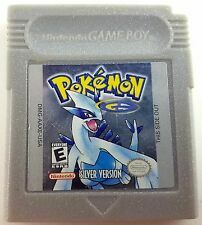 Pokémon: Silver Version (Nintendo Game Boy Color, 2000). The game has been tested and works great. The battery is brand new and saves work just fine. 4.5 out of 5 stars - Pokemon: Silver Version (Nintendo Game Boy Color, 2000) Authentic - New Battery! 263 product ratings263 product ratings - Pokemon: Silver Version (Nintendo Game Boy Color, 2000) Authentic - New Battery! Pokemon Red & Silver Game Boy games. Authentic, Saves & Tested. Condition is Very Good. Shipped with USPS First Class Package. NEW BATTERY! Once again, the picture displayed is of the actual item you will receive - nothing more, nothing less. If not paid for by the 7th, the item will be relisted. Item - Up for sale is the item exactly as shown in the picture(s). Pokemon Gold & Silver Game Boy Color Games. Condition is Good. Shipped with USPS Parcel Select Ground. 🎮 Pokemon Silver Version - Authentic Nintendo Gameboy -Tested and working. Pokemon: Silver Version (Nintendo Game Boy Color), Cart Only, Authentic!!! Pokemon: Silver Version (Nintendo Game Boy Color), Cart Only, Authentic!!!. Condition is Acceptable. Shipped with USPS First Class Package. 4.5 out of 5 stars - Pokemon: Silver Version (Nintendo Game Boy Color), Cart Only, Authentic!!! 263 product ratings263 product ratings - Pokemon: Silver Version (Nintendo Game Boy Color), Cart Only, Authentic!!! Condition is Good.TESTED AND THEY BOTH WORK. Initials on the blue edition cover. Authentic Pokemon Silver! *GREAT CONDITION*(Fast Shipping) Very Clean! As for Pokemon silver it’s in very great condition! None to small visible scratches on cartridge. Battery has not been changed, sold as is. Game works great! Fast shipping! Ships next business day. Closed on weekends. 4.5 out of 5 stars - Authentic Pokemon Silver! *GREAT CONDITION*(Fast Shipping) Very Clean! 263 product ratings263 product ratings - Authentic Pokemon Silver! *GREAT CONDITION*(Fast Shipping) Very Clean! Authentic Pokemon Game - Silver Edition Gameboy. Condition is Like New. Shipped with USPS First Class Package. BUY ONE FROM Japan and it will take 2 to 3 weeks. B: good condition. No major wear. A: good/very good condition. There is very minor wear or minor discoloration, marks/scratces. Box holds up well. Manual is good with possibly minor cover wear. In Silver, Gold, and Crystal, you cannot save without a working battery. Needs battery replaced DOES NOT SAVE GAME. I have several available. Shipped with USPS First Class Package. NINTENDO GAME BOY POKEMON SILVER VERSION VIDEO GAME CARTRIDGE ONLY - TESTED! Resale stickers have been removed. Surfaced & Verified - Discs are buffed on a professional machine to protect from future scratches. Pokemon: Silver Version Nintendo Game Boy Works But Needs Battery. Condition is Acceptable. Shipped with USPS First Class Package. Found my old Pokemon silver. Pokemon Series English Game Boy Color GBC New *Logo Shell* Pick 1 Play Now ! Pokemon Silver US Version New Sealed VGA 90+ GOLD POP1 - HIGHEST GRADE! Pokemon Silver US Version New Sealed VGA 90 GOLD POP1 - HIGHEST GRADE!. Condition is Brand New. Shipped with USPS Priority Mail. Approx 3 weeks from JAPAN to U.S.A. . There are dirt, scratches, yellow tints etc. Pokemon Gold and Silver for Gameboy Color; authentic, tested!